Standard Default Values: these default values will make it easier for users to complete your forms. For example, you could automatically populate a logged-in user's first name, last name, or email address. Placeholders: these default values will clear when a user begins typing in the field (in the case of instructions or an example). These default values are not saved with the form submission. Note: Default values will be used when a new entry is created or when a field is conditionally shown. Default values will NOT replace submitted values when you edit an entry, even if the submitted value is empty. 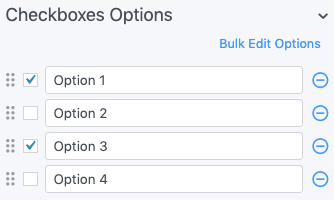 If you would like to add a default value to one of your fields, select or enter the value as you are building/editing the form. Go to your form 'Build' page. Select the field where you would like to insert a default value. Insert the desired default value text into the field. When the text is inserted, the default value icons will appear to the right of the text box. By default, the icon will appear. Leave this icon as is so the default value will become a regular field value rather than a placeholder. If the icon is showing, click it to switch it to the icon. You may switch the to the icon to prevent the default value from being submitted by the user when the field is marked required. Find the Radio field that you would like to set a default value for, and select the default option. After doing so, update the form. The form will have this option selected by default, but the user can still change the selection. Find the Checkbox field that you would like to set a default value for, and select the default option(s). After doing so, update the form. The form will have this option(s) selected by default, but the user can still change the selection. 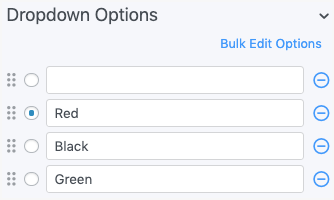 If you would like to set a default value for a dropdown, select the option from the dropdown on your form building page, then save. The form will have this option selected by default, but the user can change the selection. Form placeholders are typically instructions or text that tell the user what to enter. 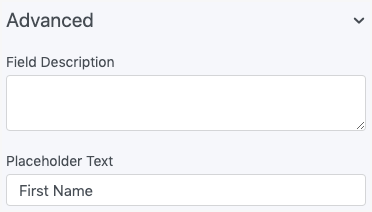 You may see 'First Name' in a text field, for example, and then you know to enter your first name. In a dropdown field, you may see '-Select a meal-' and then you'll know you need to select a meal. Placeholder values are not saved with the entry. Select the field where you would like to insert a placeholder. Insert the desired placeholder text into the field. When the text is inserted, the default value icons will appear to the right of the text box. By default, the  icon will appear. Click this icon to switch it to . Select the Dropdown field where you would like to add the placeholder. Select the value you would like shown as the placeholder. When a value is selected then the validation icon will appear. By default the icon will appear. Click on the icon for to appear. If the icon is showing, the user will not be able to submit the form without selecting a different option if this field is required. The placeholder value will not be saved with the entry. 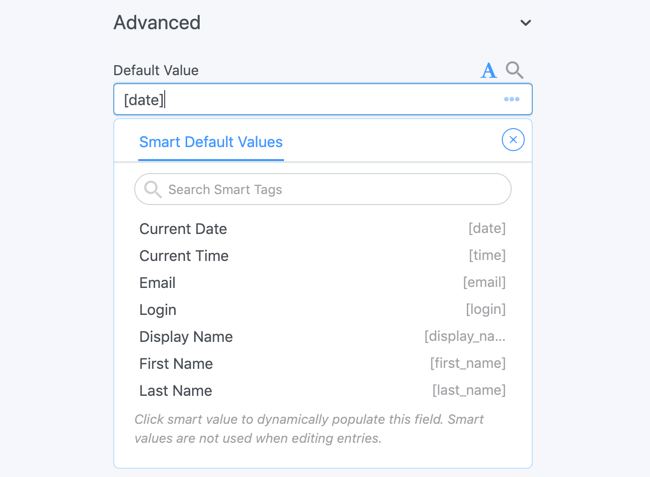 If your dropdown field is using autocomplete in the field settings you will see either 'Select some options' or 'Select an option' as the default value. To change this text, go to the Customizable HTML for this field and change [input] to [input data-placeholder="Placeholder here"]. To change the color of the placeholder text inside a field, see the instructions in styling placeholder text. Dynamic default values are default values that are dynamically generated. This is helpful because you can populate a field with a user's first and last name from their profile, for example. Or you may populate a field with a user's address that was submitted in a previous entry. Dynamic default values are generated by inserting a dynamic default value shortcode directly into the field on the form builder page or by inserting the shortcode in the Dynamic Default Value box in the field options. On the form builder page in the right sidebar, there is a Default Values tab. This tab gives you a complete, clickable list of the dynamic default value shortcodes which you may use. If you have a text field, put the shortcode directly into the field as shown below. If you have a Checkbox, Dropdown, Radio Button, or Dynamic field, go into the Field Options and insert a dynamic default value shortcode in the Dynamic Default Value box as shown below. The following is a list and description of all the dynamic default value shortcodes which you may use in your form. If you would like to set a custom dynamic default value, you can create your own WordPress shortcode or use the frm_get_default_value hook. If you need a default date other then today, use the 'offset' option in the [date] shortcode. For example, to get the date 3 days from now, use [date offset='+3 days']. This option can also be used in combination with the format option. [date offset='+3 days' format='Y-m-d']. When using offset, you may use any date string that is accepted by the PHP strtotime() function. Not sure what can be used? Take a look at a few common examples. Use [auto_id start=1] to insert a number that increases by one with each entry for the form. This shortcode can include a prefix and/or suffix along with it, but the prefix and/or suffix should not include numbers. The [auto_id] shortcode always returns a unique value. The final submitted value may end up being different from the value displayed on the screen when you first load the form, such as if there are multiple users filling out the form at the same time. First, the value is checked against other saved values when the form is loaded. It is possible that two people may be filling out a form with the same auto id value. Second, when the form is submitted, the value is checked during validation against the latest value stored in the database and updated if the value has been used. There are cases when the auto id is not unique when two people submit a form in the same millisecond. This is rare, and can be prevented by marking the auto increment field unique. This will cause one of the two users submitting at the exact same time to resubmit, updating the value correctly. Note: The [auto_id] shortcode is not set-up to work inside of repeaters. This shortcode allows you to access PHP's $_SERVER superglobal, including page URLs. See the full list of available SERVER values. Get the URL of the current page or the referring page. Use [server param="REQUEST_URI"] in a text field/hidden field to get the URL of the current page. Use [server param="HTTP_REFERER"] to get the URL of the previous page. If you are using this value in a multi-paged form, the field must be on the first page of the form in order to get the desired value. Use [get param="param_name"] to get a parameter from the URL or from the WP Query object. Replace 'param_name' with the parameter name. For example, in url.com?job=cashier, the parameter name is 'job'. You would insert [get param=job] in a field or View, which would automatically be replaced by 'cashier'. If the parameter is blank or not included in the URL, you can set a default value with default="Default Value". Note: When using this shortcode to filter a Formidable view, always set a default value (i.e. default="0") when filtering sensitive information/entries in order to protect entries that should not be public. It may be helpful to automatically pass information from a View or a form to another form. This can be used to display or store additional information in the second form. Go to the View or form that you want to pull information from (Form 1), and add a link to the page containing the second form (Form 2). If adding this link to a View, include it in the Content or Dynamic Content box. If you are sending users directly from Form 1 to Form 2, select "Redirect to URL" in the Settings for Form 1 and add the link there. At the end of the link, add a parameter to the link like ?param-name=. The full link will look like example.com/my-page?param-name=. Replace 'param-name' with any parameter name you would like and replace '254' with the field you want to pass into the URL. Add a field to Form 2 with [get param='param-name'] as the dynamic default value. This will display the field value from the View or Form 1. Passing information from a View or form to a dynamic field in another form can help automatically link two forms and make all of the information from Form 1 available in Form 2. At the end of the link, add a parameter to the link like ?param-name=[id]. The full link will look like example.com/my-page?param-name=[id]. Replace 'param-name' with any name you would like but leave [id] as it is. Now, when the user clicks the link in the View or hits "Submit" in Form 1, Form 2 will be automatically linked to Form 1. In the emails, posts, or Views for Form 2, all of the information from Form 1 will be accessible. Use [frm-field-value field_id=x user_id=current] to get a value previously submitted in a field by the current user. Replace x with the ID of the field you would like to retrieve the value from. For more information about this shortcode, please see the frm-field-value page.